Hi, I’m Harvey Ferris with New Hill Garage. 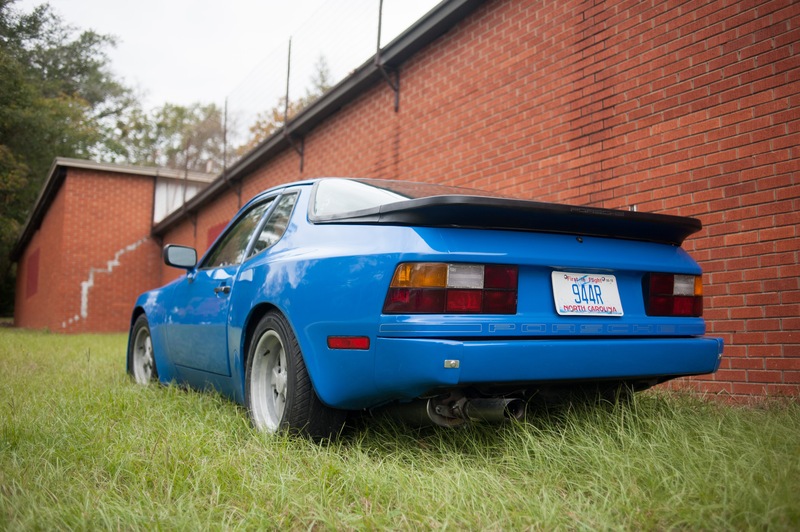 If you are reading this article, it is probably because you are interested in my 944R being auctioned on Bring A Trailer. I know it is hard when you are bidding on a car that is a long ways away and you can’t come to see it. Hopefully this article will give you the information you need and the confidence to bid on this car. You may have already noticed that my website, www.newhillgarage.com, contains a number of posts regarding this car, starting back when I first purchased it. These articles are meant to be instructional in nature and go into quite a bit of detail. You are encouraged to read the ones that interest you. The complete list of articles is here. And if you haven’t seen it yet, here is the link to the excellent video that my friend Mike put together. We had a lot of fun doing this and I learned a lot about video production! First, I would like to discuss the history of this car. 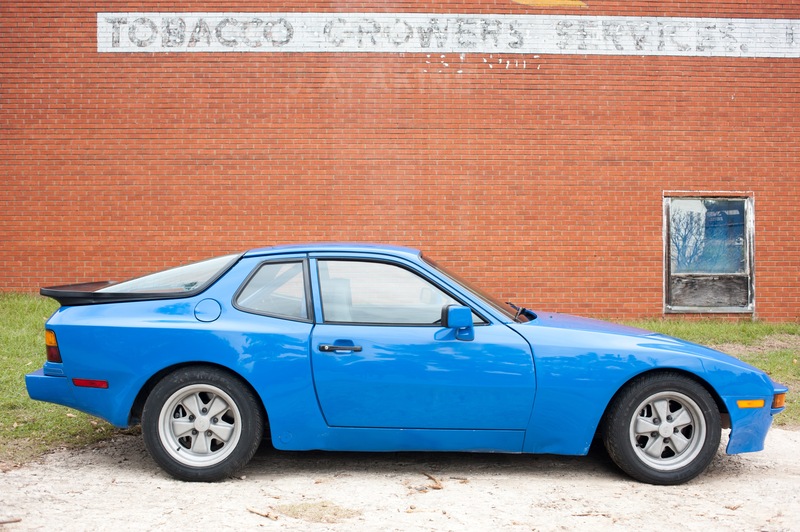 It is a 1984 Porsche 944. It is a normally aspirated car, as the turbo cars were not offered until 1986. It has a 4 cylinder engine with a total displacement of 2500 cc. This engine is listed as having 143 horsepower. It has a 5 speed manual transmission, using a transaxle located near the rear axle. In this way, Porsche obtained a very neutral 50-50 weight balance. As such, these cars handle well during cornering, without bad habits such as off throttle oversteer associated with the 911 rear engine configuration. 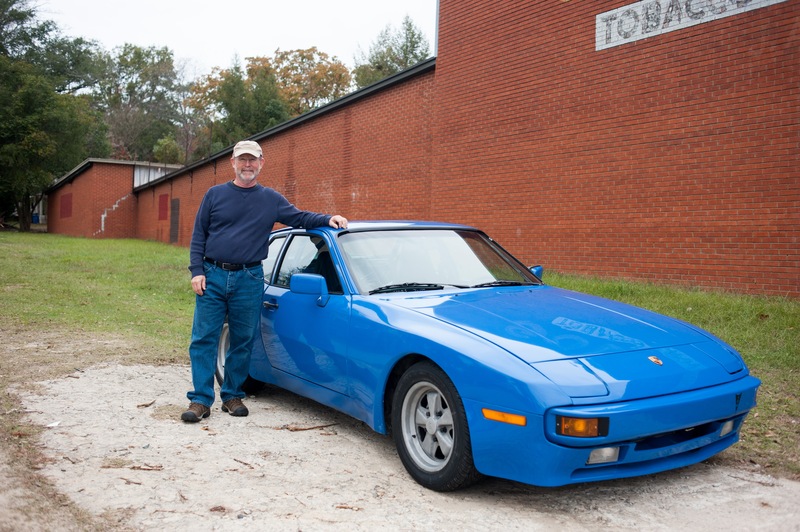 The 944 was styled by the famous Porsche designer Harm Legaay. The flared wheel wells allow ample tire and wheels to fit. For instance, this car is fitted with 225 mm wide tires at all four corners. I purchased this car about 5 years ago out of South Carolina. Let me be clear. When I bought it, this car was in poor condition. 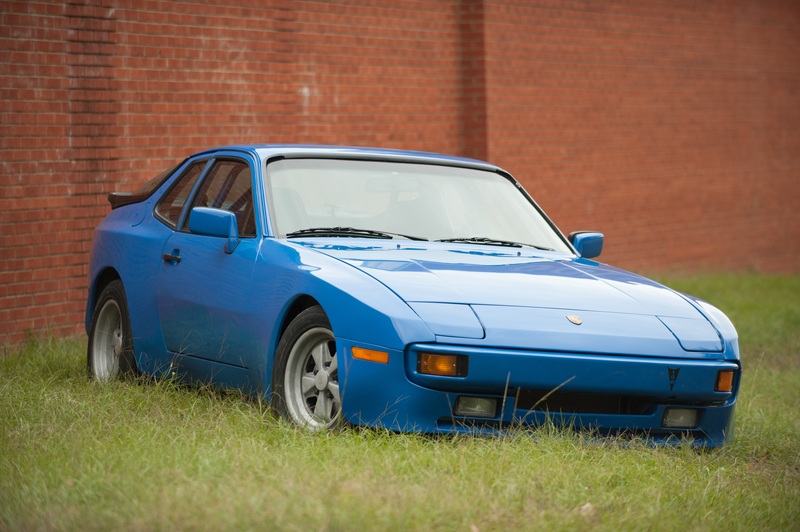 I was attracted to it because I wanted to have a second 944 in my garage to use as a backup to my 944 track car. It had Fuchs wheels and sport seats. The engine started and ran. But the cosmetic condition of the car was poor, with the exterior showing poorly applied bondo and grey primer in several areas. The dash was horrible. The sport seats were complete but very soiled. I didn’t want to think want was embedded in the carpet! As you can see from this list, all of the important suspension parts were replaced with new or good used parts. I also did a dye penetrant examination of the front hub spindles to make sure they were not developing fatigue cracks. 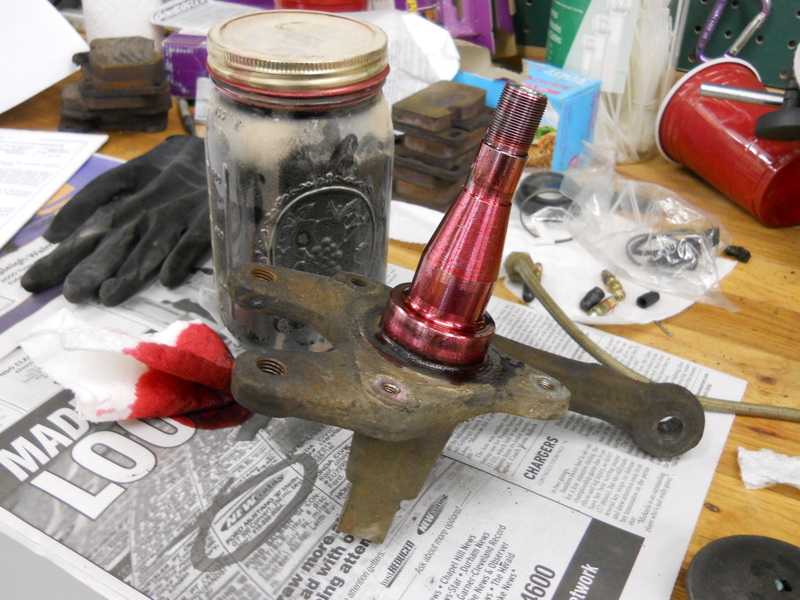 Red dye applied to front spindles. After wiping and application of a developer, any cracks would be revealed. 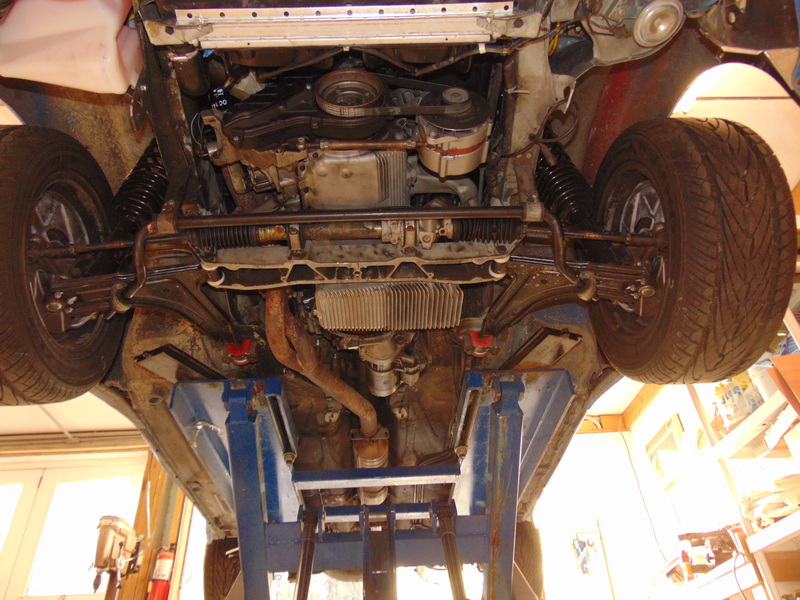 As this was a backup to my track car, I removed all the hydraulic components for the power steering and thus “de-powered” the steering rack. I had done this previously with my track car. The car is of course harder to steer at low speeds but I like this manual rack arrangement for track and high speed road use. Steering rack, with all power assist components removed. I should note that in the spring of 2017, after putting some miles on the car, I noticed high oil consumption. After some investigation, I determined that there was scoring in one of the cylinder walls that was allowing oil to push past the rings. I sourced a replacement block, installed it, and that fixed the problem. During this effort I replaced some items including the rod bearings, the balance shaft bearings, the timing belt, and the balance shaft belt. Additionally, the brake fluid, oil, and oil filter were changed. 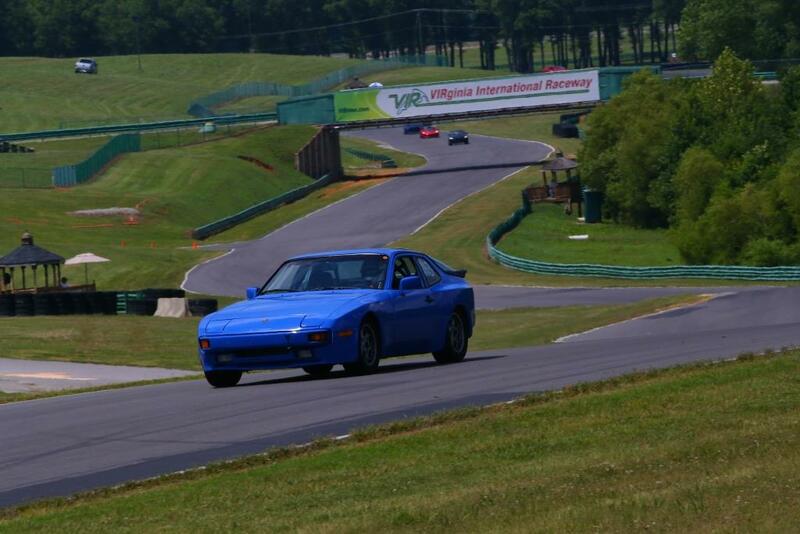 This all occurred right before I took the car to VIR for its first (and only) track event. The engine performed quite well at that event. So that about covers the engine. Let’s talk about the air conditioning for a minute. I did a number of things on the car to reduce its weight. One big weight reduction was obtained by eliminating the air conditioning compressor. So this car has no air conditioning. That said, I only removed the compressor, its immediate hose connections, and the dryer. If you buy this car and decide that you need air conditioning I would say you can certainly restore the system back to operating condition if you wish. I was always on the lookout for opportunities to disconnect, clean, and re-assemble electrical connections. I try and use a product called Deoxit on all important electrical connections. Without going into great detail, I found a number of electrical issues that I corrected over the years I was working on this car. Also, the relay/fuse panel was totally dis-assembled, cleaned, and new fuses were installed. In an effort to assist myself and future owners, I have applied labels to most of the wiring connections under the dash. All the ground points were identified and cleaned. 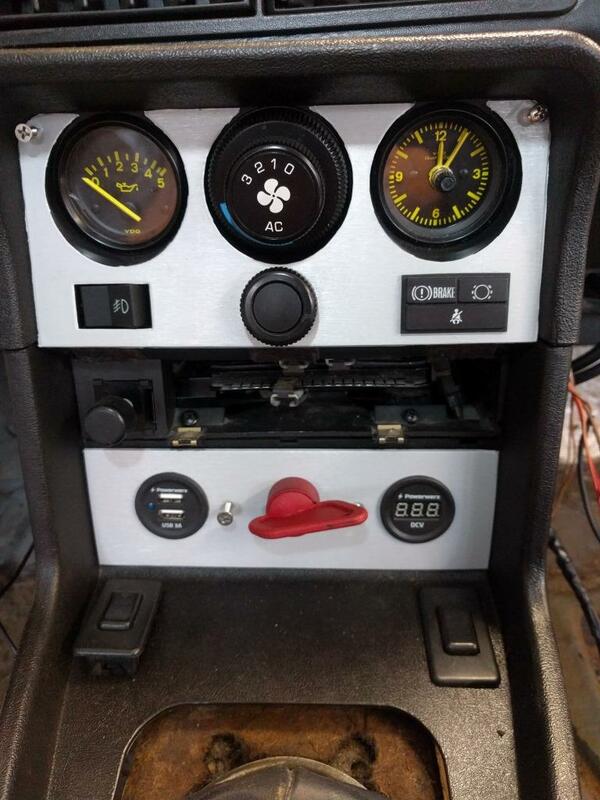 The dash has been modified to eliminate the radio and substitute a master electrical cut off switch. If you are interested in the details regarding the master switch that I installed, there is a nice article on the website about that. As a nod to the modern era, twin USB ports are included to power your devices. I added a digital voltage gauge, mainly for symmetry. Significant systems that have been restored to operating condition include the pop up headlights, the fog lights, turn signals, emergency flashers, brake lights, handbrake, heater fan motor, electric windows, horn, wipers, electric trunk latch, radiator high and low speed fans, and, miracle of miracles, the sunroof opens and closes. It does need a little assistance by hand to get it fully closed. The only systems that are not working are the rear window defrost and the reverse or backup light. I can probably get these working if they are a critical item for the new owner. Radio delete, with the space being used for a Master Kill Switch. Now it was on to the bodywork. My self respect would not let me drive a car with such a horrible external appearance. I decided that a full paint job was required. I have painted about a half a dozen cars. I am not a first rate painter but with time and elbow grease, I can get the job done. It is said that good paint jobs are all about the prep. There are detailed articles on my website about the paintjob but in general, the exterior of the car was sanded down, being careful to preserve as much of the E-coat as possible. Porsche starting using an E-coat in the 80’s. E stands in my mind for electro-plating where the manufacturer dips the body shells in a zinc solution that is electro-plated onto the steel body. This is a key step to keeping a car from rusting. 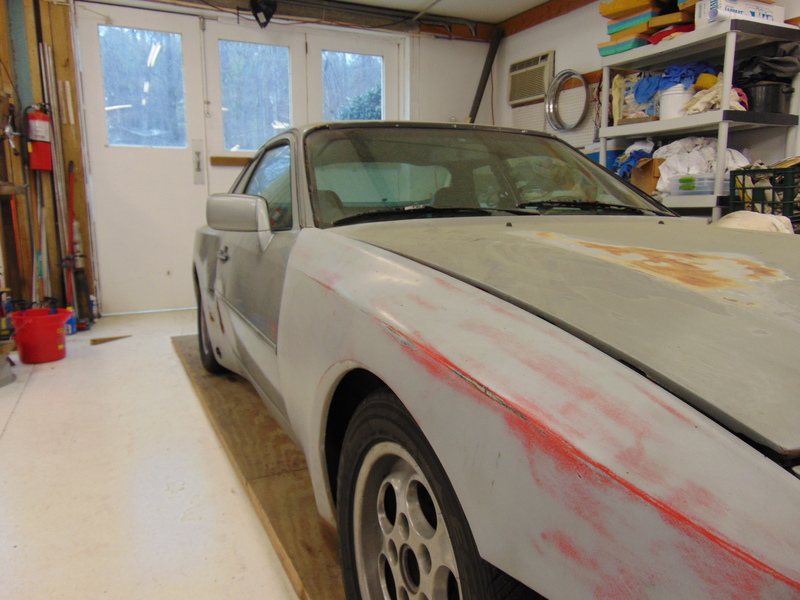 Unlike my Jag E-Type, I found zero structural rust on the 944. I then applied an epoxy primer coat and multiple high build urethane primer coats. The high build primer was block sanded to a perfect finish. Final surface before painting with color. 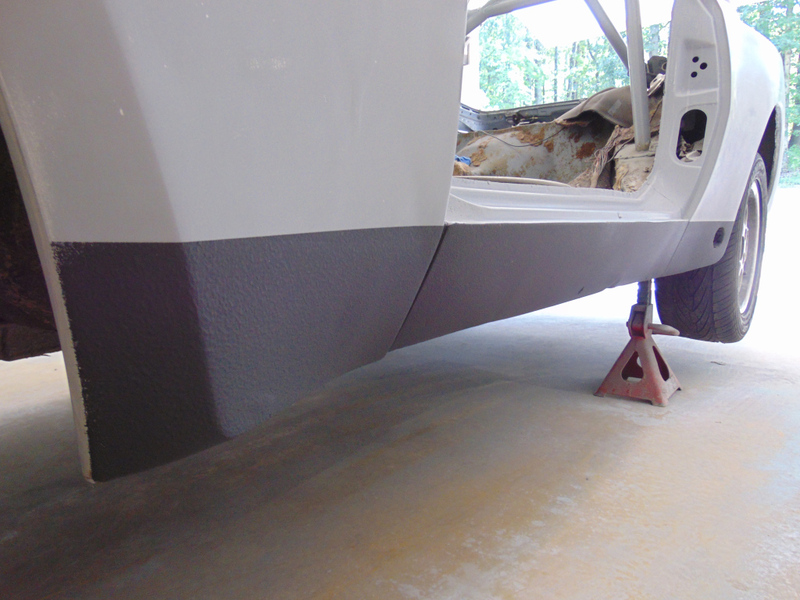 The black area is Gravitex, which is an extra strong undercoat that resists chips from rocks, etc. Finally I was ready to shoot the color coat, which is a Glasurit 22-line single stage urethane paint. As discussed in one of the website articles, the color coat was subsequently wet sanded to obtain a very smooth surface and then buffed in stages to return to a beautiful shine. Paint applied and post paint wet sanding in process. When people see the car they ask “What is that color?” Well, that’s a bit of a funny story. The car was originally painted Zermatt Silver at the factory. I started out thinking I would paint the car an old school grey color, as seems to be popular with old Porsches these days. I sprayed my selected color on the roll bar and decided I just wasn’t happy with the look. 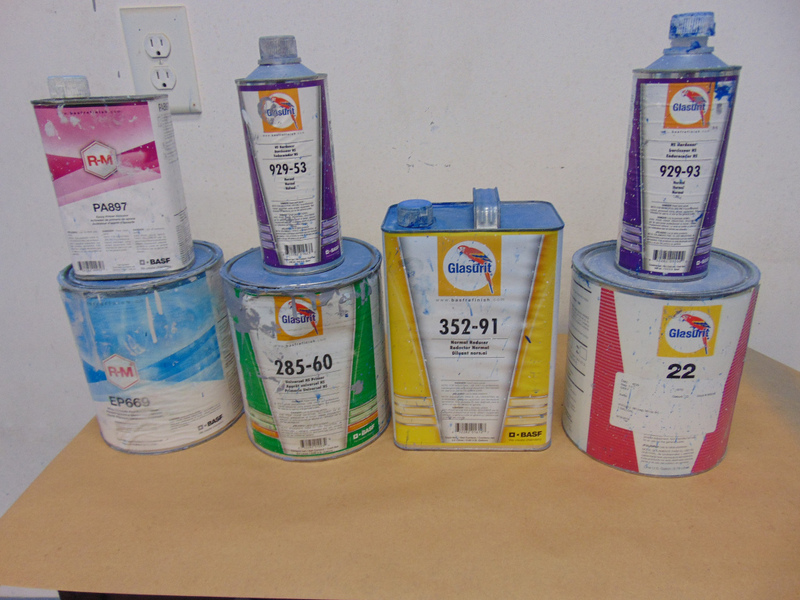 So I took my $675 gallon of Glasurit paint back to Wanda, the manager of my local paint store, and we looked at some paint chips with various blue colors. Fortunately grey paint is an excellent base color to work with. She disappeared into the back and returned with a custom blue mix. We took a small sample outside to look at it in the sunlight and I pronounced to be perfect! Trust me, there is probably no other Porsche out there with this paint color. It is truly a custom mix. If you have to give it a name I would call it Agean Blue. The sale of the car comes with my remaining pint of paint and the custom recipe, which can be reproduced at any Glasurit paint jobber. Upon close inspection, this paint job is not perfect but it is very nice and makes a good impression on all that see it. 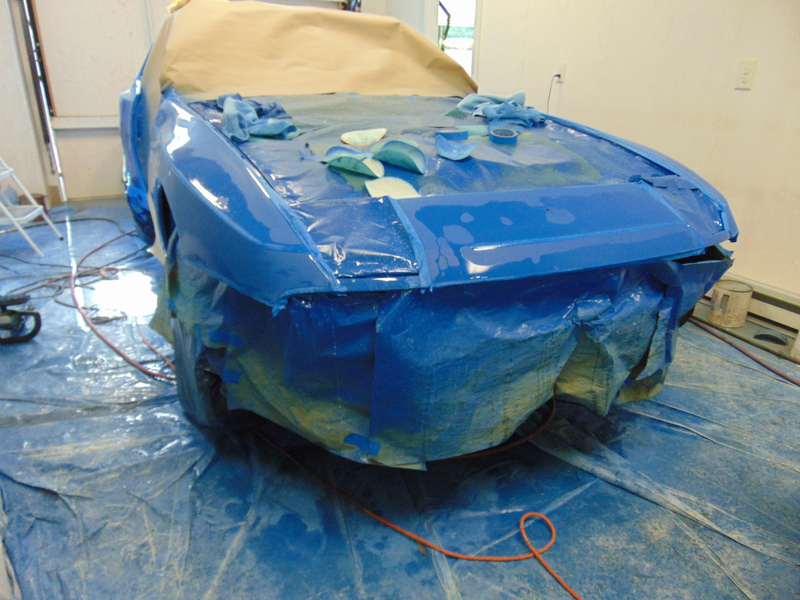 If you are going to drive the car, and I hope you will, this paint job is very commensurate with a driver’s car, as the single stage paint is relatively easy to make spot repairs upon. If the successful bidder desires, I will be happy to coach you on how to make minor spot repairs. Let’s talk about prior collision damage. I have no doubt that this car has been in several fender benders. The Carfax certainly indicates something happened, resulting in a Salvage title. Both of the front fenders clearly came from a red car. When I removed the existing bondo behind the doors, there were multiple dents. If purchasing a car with some accident history puts you off, that is understandable. But I can assure you that I have been over every inch of this car, inside and out. There is no body damage that hasn’t been expertly repaired personally by me. I saw no evidence of unibody or frame damage. The wheel alignments were brought into spec. I did extensive testing as the build was brought to completion, including high speed track work at Virginia International Raceway. It drives and handles very well! Please note that the my current NC title states SALVAGE/REBUILT. It was about this time that I started to think about an “R” concept. To my knowledge, Porsche never made a 944R. But based on what they have done historically with the R spec in the 911 world, I came up with some general guidelines. Weight reduction. More aggressive suspension. Sport seats. Simple door panels. Lightweight wheels. And an engine carefully assembled to the tightest of tolerances. I was practically already there with my build! For both weight and appearance purposes, I removed the front and rear rubber bumperettes, as well as the side moldings. I removed sound deadening from the floor boards. The radio was deleted. There was one short time in the build where the car weighed just a bit under 2500 pounds. This was without any fluids in the car and no spare tire or jack. 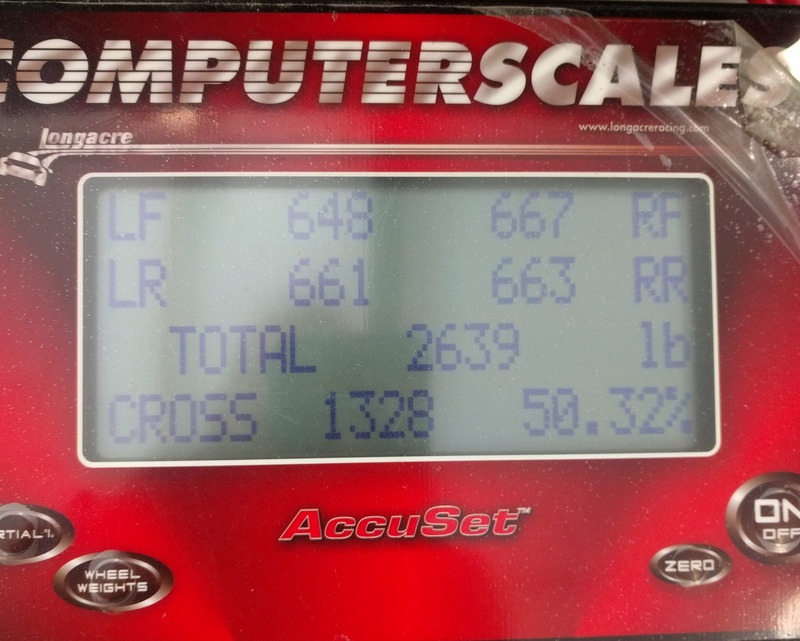 Posted below are the most recent scale weights of the car in normal street configuration, with roughly a 1/2 tank of gas. The weight is 2639 pounds. Also note the excellent weight distribution from front to rear and side to side. If you take out the mini-spare, the jack, tools, etc. which is what you would want to do for track sessions, the weight is reduced further. The weight in this configuration is 2595 pounds! 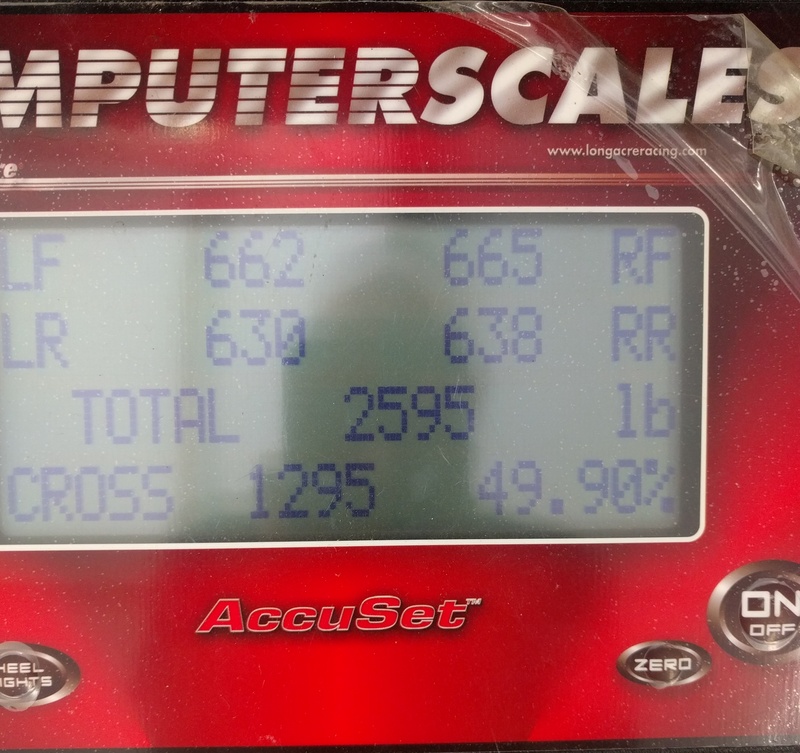 That represents a good bit of weight reduction obtained with this build! I also spent a fair amount of time experimenting with the stance of the car. Stance can be a personal thing but I think the car looks very aggressive with the front end lowered just a little bit. 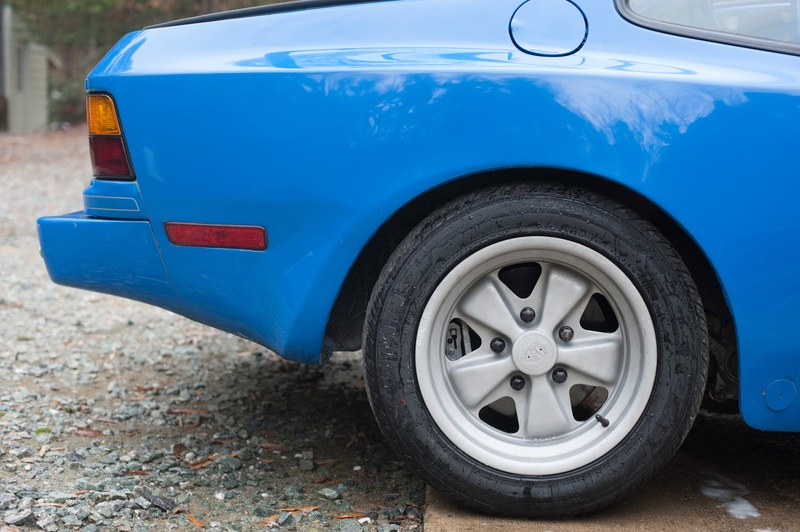 Regarding the wheels, they are to my knowledge the original Fuchs that came with the car. They are 15” diameter. The front wheels are 7” wide. The rear wheels are 8” wide. I get a little nervous about 30 year old wheels. 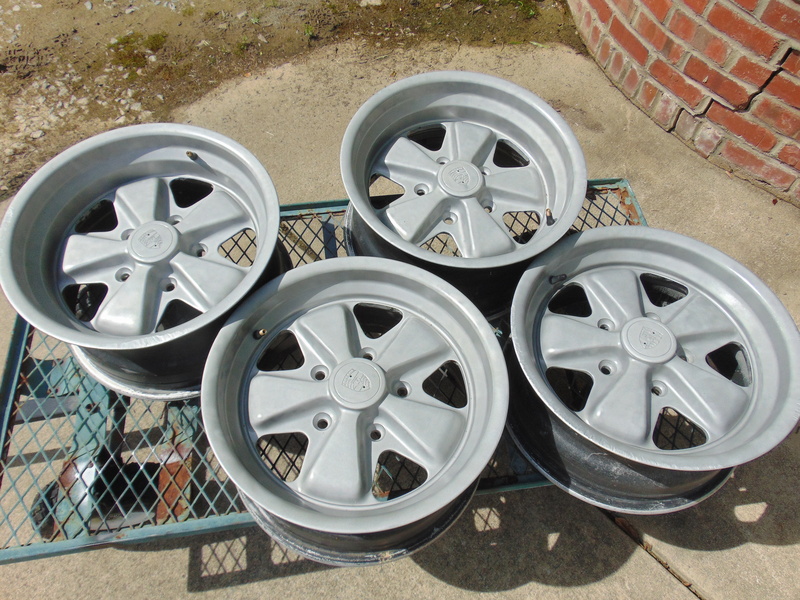 So for safety and appearance sake, I bead blasted the exterior surface of the wheels and sealed them with Eastwood clearcoat. I think they look good against the blue color of the car and in this way, any cracks will be easier to see. I have inspected the wheels very closely. There is some curb rash but no cracks. Finally, it was time for the interior. I don’t want to think about how many man hours I have invested in getting that interior whipped back into shape. My website goes into great detail regarding what was done. The short list is new dash and totally new upholstery materials on the seats, which includes new old stock Porsche script cloth. The carpet is a very nice Sliverknit, which is also very lightweight. 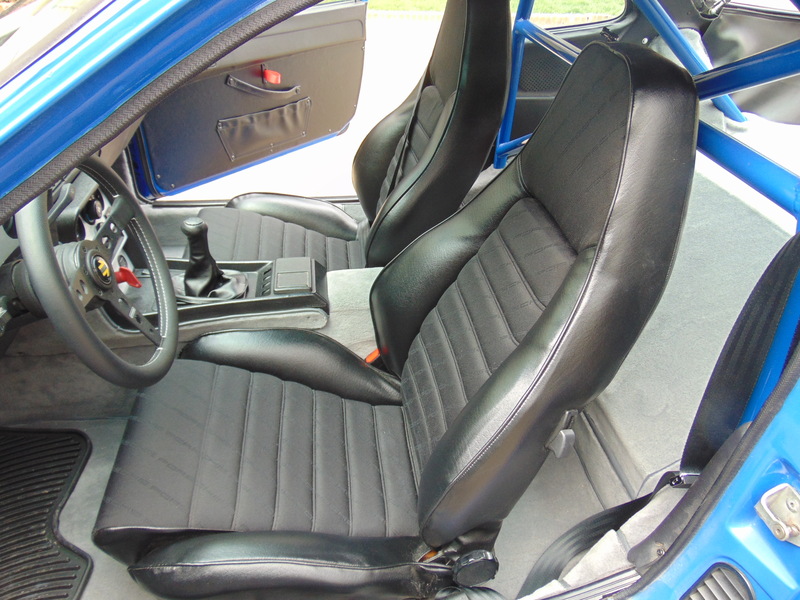 The cockpit forward of the seats has been lined with Kool Mat, which serves to insulate the car from the heat of the engine. The lower door panels are skinned with panels composed of vinyl over aluminum. RS style cloth door pulls are incorporated. I need to mention the rollbar. I am a strong advocate for safety in any car that is driven at the track or in a spirited manner. A strong rollbar may save your life. 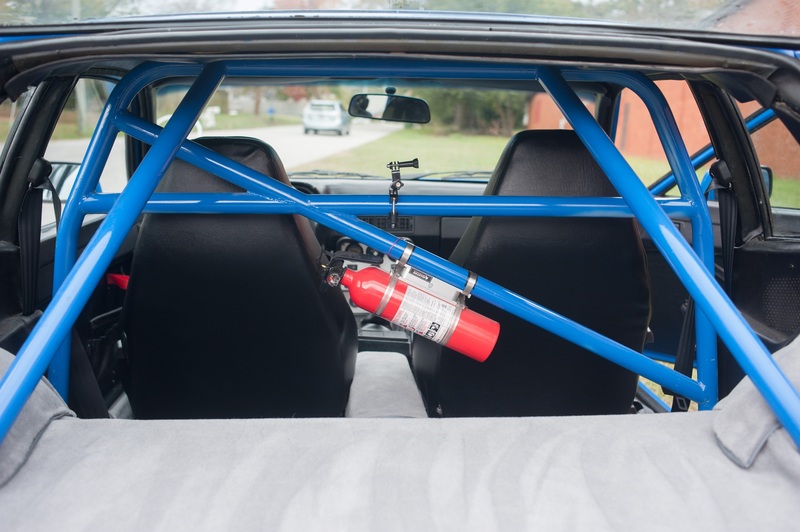 My website has the details but suffice it to say that the rollbar was fabricated with SCCA and NASA spec rollbar tubing welded by a nuclear grade welder. Check out the beautiful TIG welding he performed. My welder friend Rick is indeed an artist with a welding rod. The rollbar was painted with the same color as the exterior of the car. The 30 year seatbelts have also been replaced with new items. The Kuhmo Ecsta AST tires were purchased new last fall. I have used this same tire as my rain tires on my track car. They give very good feedback and provide a good audible warning before they decide to break loose. If you wish, I can send you a pdf file of all my receipts. Use the BAT Contact Seller button. No car is ever truly done. I might be tempted to replace the windshield, as it gets pretty hazy driving into a setting sun. If such a thing exists for a 30 year old Porsche, I would be on the lookout for a new steering rack with zero play, as the one in this car has the slightest amount of play off its neutral position. If you get into serious track time, I would advise upgrading to track rated seats with full harnesses. And the list could go on and on. But I won’t. And that about does it. I have spent the last year driving the car and getting out the bugs. I gained a lot of satisfaction from the build process and my ownership of the car. 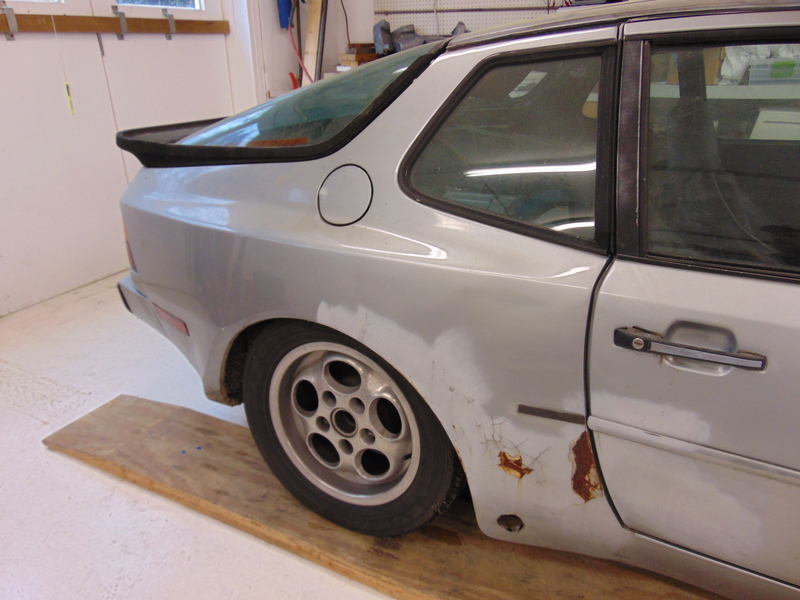 I am happy that I have saved a 944 from the crusher. But now is the time to pass it on, as I have more projects to complete before I die. Establishing a value for this car is tough. It is certainly not a low miles original car but, that said, most of the important stuff has been restored to a high standard so it should be a relatively trouble free car for someone. As I really do want to move on to other projects waiting for me, the BAT auction will be No Reserve so someone will definitely come away with this fine car. It could be you!!! If you are an overseas buyer, I could certainly assist in having the car transported to one of our ports in the south-eastern US, such as Norfolk, Wilmington, or Charleston. I hope that this article and the associated items on my website has helped you be comfortable in knowing what you are buying, with the various pros and cons as described here. I think the new owner will not be disappointed. Here is a link to a video showing the operation of the electric windows and the oil pressure at idle (5 bar! ).